I'm sure we all do it, we read other beauty bloggers posts and watch their youtube videos and make lists of products we 'must have'. Admittedly I am terrible for it and always have at least 10 things on my list! I do most of my shopping online so I always heavily rely on online swatches and descriptions. 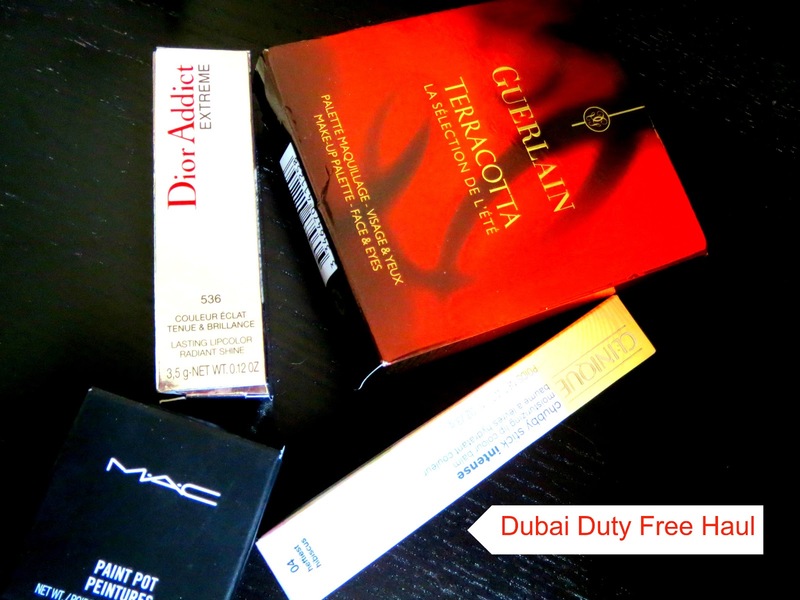 This mini haul from my last trip out of Dubai features products all purchase enabled by other beauty bloggers! Spot the cat and my Wonder Woman pj's lol! First up is this stunning double decker palette from Guerlain featuring bronzer and 4 eyeshadows. This is a special 'airport edition' and I saw this featured on Mostly Sunny back in May. As I travel very frequently at the moment I thought this would be the perfect addition to my travel make up and a way to condense it down. The compact is beautiful, a bronze shell with plenty of weight behind it. Inside is a large bronzer which is not too dark for my pale skintone and then 4 beautiful eyeshadows-the exact sort of neutral shades I wear when on business trips. Sunny has swatches of the palette here and I was super happy to pick this up in Duty Free. Next up is Clinque Chubby Stick Intense in Heftiest Hibiscus (ridiculous name) which I saw recently on one of Anna's's youtube videos. Pretty much everything Anna recommends is right up my street and I religiously stalk bloglovin and youtube for her latest contributions. Heftiest Hibiscous is a bright coral orange but with the glossiness and sheen of a balm. I find these to be quite long lasting and they don't bleed on my lip line. The Dior Addict Extreme lipstick in 'Lucky' has been on my wishlist for-ever after seeing it on Sandra's 15 steps, then a beauty blog youtube channel. Sandra has the best lipstick recommendations, I bet she has more than I do! Lucky is a bright, deep pink but wearable enough for daytime. Finally I got the Mac 'Constructivist' paint pot after watching Amelia from Liana Beauty's beautiful birthday smokey eye tutorial. Amelia has only recently started youtube videos but I am hooked! I am loving this metallic chocolate brown shade. And I picked up a great tip when watching Alix from I covet thee, whose blog I have literally just fallen in love with! She applies her paint pot with a 217 Mac blending brush and it looked so good I tried it myself today-and I loved the result! How influenced are you by other beauty bloggers?